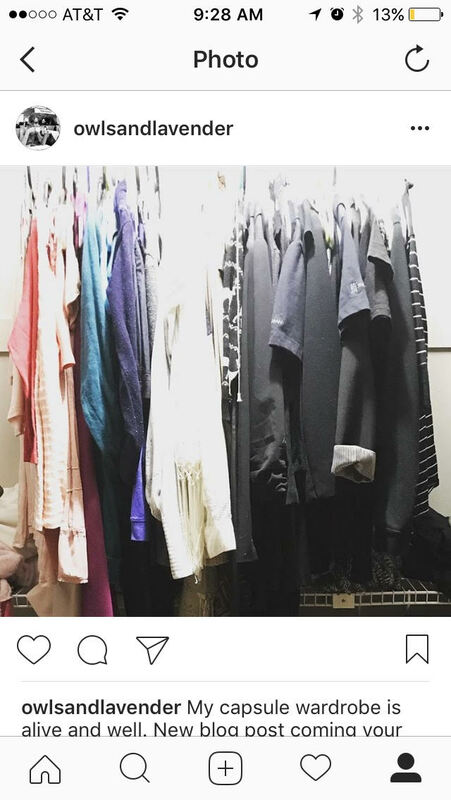 I’ve been spending a fair amount of time going through our items and donating what we don’t need, and I’ve taken an interest in small-space living, decor, organizing, and cooking! I have maintained my capsule wardrobe. 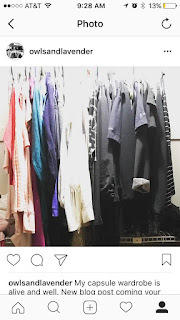 It has been nearly two years since I adopted a capsule wardrobe. I remember I made the decision a few weeks before my husband and I went to New York, and we were able to pack all our belongings in a carry-on for the entire week. This way of thinking has transformed the way I dress, eat, and spend money. In the past two years I have spent less than $100 on my clothing, plus roughly $100 on running shoes. The majority of my exercise clothing is secondhand, and 90% of my daily wear is second-hand. I own two pair of jeans--one green and one blue--and I have an array of dresses, leggings, and designer shoes (secondhand) that I wear on a regular basis. I don’t count the amount of items I have; I just know that what I do have is manageable, in good shape, and looks good on me. My interest in style has made me more aware of our space, and it has also given me a better appreciation for living in a small space. 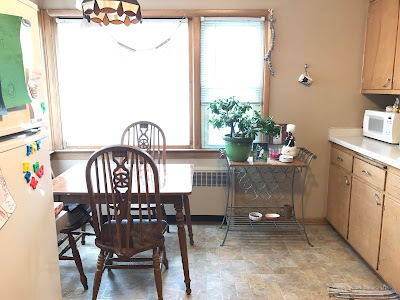 Sometimes it's difficult to be content in a small home when others have much larger homes, but when I think of the benefits of having a small space (less to clean, less to buy, less to maintain) I am thankful for what I have. Here's our kitchen space. We spend a lot of our time here! The kitty coffee mug was a souvenir from Rome, and the gorgeous jade plant was a gift from back when Audrey was born. Everything else was purchased or given to us secondhand. I have been diffusing lavender at night, and it has been amazing. I use it every night when I go to bed, and I believe it helps with my quality of sleep. My home is slowly transforming into the tranquil space I’ve wanted it to be for years. In the future, I'll be adding more plants to my home and experimenting with different oils. My husband and I have been cooking. We cook a lot, as in every night, and we sit down to eat dinner as a family. This was my one request once my first daughter, Audrey, was born. I wanted to be a family that sat down to eat together. 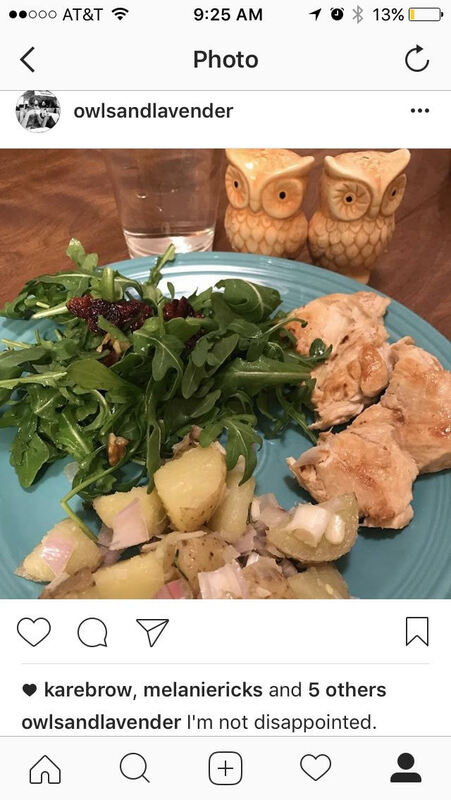 We’re very tech-savvy and worldly, so this is important to me because I believe in the good that can come from a home-cooked meal. It’s important physically, emotionally, and I’ll go as far as to say cooking can be a spiritual experience. Believe me, I need a lot of help from God to cook. We have perfected several recipes recently, which I’ll share in future posts. For the past year I have been working on a children’s book. I work on it at my own pace, without pressure from anyone, and it’s for fun, but I’d like to publish someday. One of my goals since childhood has been to write a book, and when I was in college a professor of mine--whom I fully respect--mentioned to our class that we shouldn't publish a book until we’re at least in our thirties. I don’t remember what the context was surrounding this theory, but I took it as law, and I’d like to publish my first book to the world at age 30. That gives me two (or more) years to complete this project, and I think I can do it. I’m not sure if I’ll go through a publisher. I think I’ll tackle the project solo and publish via Amazon. I have a little bit of time to prepare. I have been working on my friendships. It’s easy to forget that friendships take time to make and maintain. Sometimes I have to drink an extra cup of coffee to meet up with old friends, new friends, and college friends every couple weeks. It keeps me young and in touch, and it’s refreshing to be around people who don’t need something from you. ← That’s sad, but true. With working full-time and having a 50-mile commute, this can be so hard, but it’s so worth it. I went indoor rock climbing with my friends from college for my 28th birthday! This was my first year fully committing to a New Year’s Resolution, and it’s actually working. I have officially lost 10 pounds of baby weight since January 15th, and as of this morning I have 10 pounds to go. My progress has been slow, but steady, and I’m pleased with it. While many blogs and Pinterest boards might suggest women should gain and lose baby weight within 9 months, it actually takes the average woman more than one year to recover from childbirth. That’s totally normal. I’ll be writing when I have time, but I’ve made it a priority to write more for others. I enjoy publishing short articles like the one you’re reading above, so in the future you can look forward to some recipes, healthy living tips, parenting and career updates, and more. Ciao! Allow me to share some of my lifestyle inspiration! These bloggers and documentaries have helped piece together my personal style and interests.